Tags: multiple domains and WordPress. To start with another domain name was obtained and pointed to the existing site. There was talk of a separate site but since a lot of the information and events are common to both churches one site would be easier to manage. The zeeMagazine theme is not responsive so while redevelopment was happening I took the opportunity to change to a child theme based on Twenty Fifteen, the theme that comes with all WordPress installs. To manage multiple domains I installed the Multiple Domains with Analytics plugin. This allows you to change the site name and tag line for each domain. So www.merndapc.org.au gives a different site name and tagline to www.whittlesea.org.au. 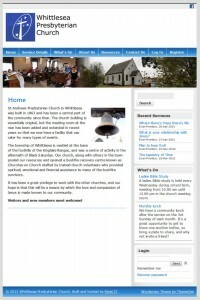 The two churches are now easily managed via the same WordPress website. The design is responsive and easy to navigate with a mobile phone. At the moment sermons are not recorded and for the present are not available. This may change in the future. Whittlesea and Mernda Presbyterian Church needed a website that would make available all of the events and other information about the parish. And to cater for those who can’t attend church; being able to listen to sermons online would be nice too. I wanted to keep setting up quick and economical; so I turned to WordPress. Another site where the client had very few photos of their realm. One Sunday I paid a visit and got some suitable photos as well as catching up with Evan. It’s good mixing business with social activities. And churches make great photographic subjects. I love the architecture and history behind them. The site uses the zeeMagazine from ThemeZee. It has a number of good features like featured article and easy Facebook (the link goes to the Whittlesea Presbyterian Church group) and Twitter. The menu was just a plain blue so I added some 3D shading to it using Colorzilla’s CSS Gradient Generator. A nice improvement. There was an interest in putting the sermons online. A quick search using the built in Plugin searcher found a readily available Plugin called Sermon Manager for WordPress. You can upload sermons and group them according to sermon series and topic. Parishioners can download the sound file (in MP3 format) or listen to the sermon online. Accompanying notes (in PDF format) can be attached to each sermon. Sermons can have verses attached and when the user places the mouse over it the entire phrase pops up. Very nice. They can be submitted to iTunes and to pod casting sites. The latter is my favourite as they are then readily accessible by Android phones using BeyondPod.